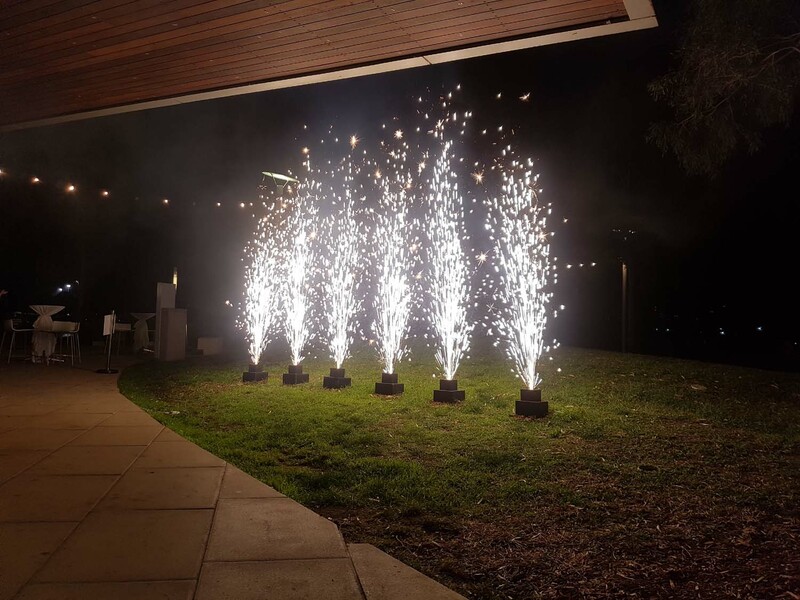 Close Proximity (CP) Fireworks are generally the sort used for concerts, stage and theatre, stadium events or at weddings for the first dance and cake cutting. There are a number of different things that can be done for weddings like the bride and groom entering up the drive or walking into their reception. We can arrange Gerbs along either side of the driveway or on the four corners of the dance floor. A Gerb is a fountain. It has a spray of sparks that shoot out from the top centre of the firework. Of course, using Close Proximity pyrotechnic effects require different safety controls than outdoor fireworks displays. Whilst we don’t need as much safety area in order to use them, we have to be very particular with the venue room itself. There can be no hanging drapes or objects that could catch fire. Ceilings need to be higher than a standard room. We also need to be able to isolate or turn off fire alarms. The last thing you want on your wedding night are 12 fire officers charging into the room dousing the candles on your wedding cake. There are a number of different indoor pyrotechnic effects that can be used. Flash Pots are another type of effect. They burst and give a white flash of light. There is some smoke with these. 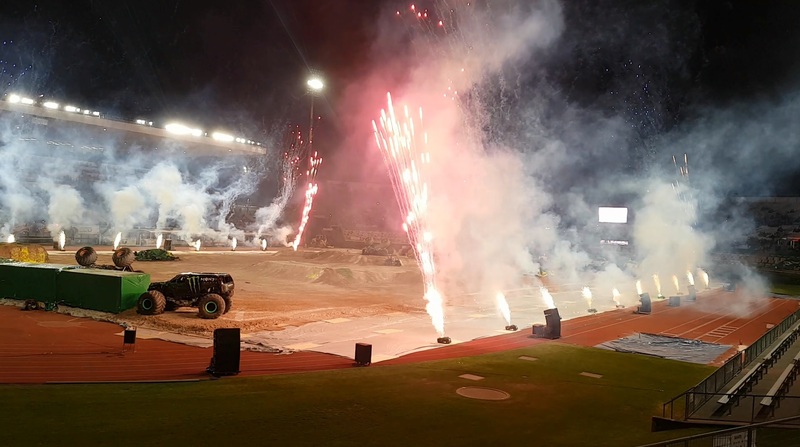 These can be used for motocross jumps. As the riders go over the jump near the crowd, we set these off so that it heightens the effect of the jump, making it more exciting and dramatic. Indoor products are manufactured differently to outdoor effects. They are manufactured with exact ingredients. Tube sizes are often smaller so the effect is smaller. They are designed and manufactured specifically for the use in stadiums, on stages, on dance floors and inside reception rooms. That is why outdoor pyrotechnic effects cannot be used in an indoor setting, however, and indoor product can be used in an outdoor fireworks display based on the outdoor fireworks safety controls. From Gerbs that spray sparks continuously to Close Proximity Mines that shoot an effect into the air in one shot. There are various colours and effects in mines like crackling mines and red strobes. Unfortunately for indoor, there is nowhere near the range of products to choose from when designing a show. You cannot compare an outdoor display with an indoor display. They are both completely different. They have different safety rules, different requirements and different functionality. An Indoor effect or display is designed for an emphasis on something, so there may be a big bang and a white flash which highlights a particular stunt or musical piece for instance. So, you may spend extra money on an indoor display to get that emphasis on a chosen piece but it does not go anywhere near as long as an outdoor display. It is simply because the two have totally different outcomes. Every display we do is designed differently. No 2 shows are the same. If you are looking for an Indoor display, then look no further. We have a team of pyrotechnicians that can create the magic for you. We can create that dramatic effect you are looking for. Having the dance floor come alive as the bride and groom complete their signature dance or add more flair to the concert; it truly is magical. Book an Appointment for Your CP Display Today!